Reunification Palace was formerly known as Independence Palace. The current building, completed in October, 1966 is a relatively new arrival to Ho Chi Minh City or, Saigon as it was known back then. It replaced Noordam Palace, which was severely damaged in 1962 in a bombing raid by two rebellious South Vietnames pilots who clearly didn’t approve of the President at the time, Ngô Đình Diệm. Rather than have it repaired, President Diem ordered it levelled and a new one built in its place. The design of the new building is by one of Vietnamese the most decorated architects, Ngô Viết Thụ. Amongst other awards he recieved the Prix de Rome in Architecture. In my opinion, it’s not a particularly beautiful building but it certainly is imposing and recognizable as a key landmark in Ho Chi Minh City. Construction of the current Reunification Palace started in 1962 and was compeleted in October 1966. Unfortunately for President Diem, he never got to move in as he was assassinated in 1963 by some of his own staff. Instead, General Nguyễn Văn Thiệu, Chairman of the National Leadership Committee, and head of a military junta at the time moved in. He hung around until April 1975 when the North Vietnamese Forces were clearly taking control of the South. At which point he fled. Those around at the end of the Vietnam War probably have pictures of a North Vietnamese army tank crashed through the ornate gates on April 30, 1975 etched in their mind. This action effectively signalled the end of the War. 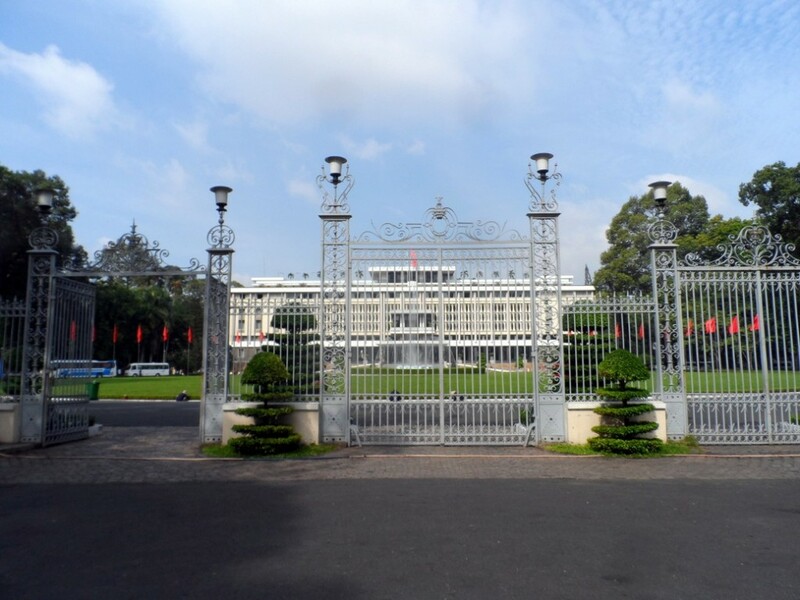 After all the treaty negotiations were completed between the two sides in ovember 1975, the Provisional Revolutionary Government promptly changed the name from Independence Palace to Reunification Hall. The complex, which spans a full city block, is now used as a museum. Visitors can visit most areas of the building including the downstairs meeting rooms, up stairs reception rooms and the President’s personal chambers. The second floor features an “interestingly” decorated card room, a cinema and a rooftop nightclub complete with helipad. In the basement you can see “the war room” displaying maps and charts and the telecommunications hub. There is also a room which shows videos about the Palace in 5 different langauges. The national anthem is played at the end of the tape and you are expected to stand up as a sign of respect. 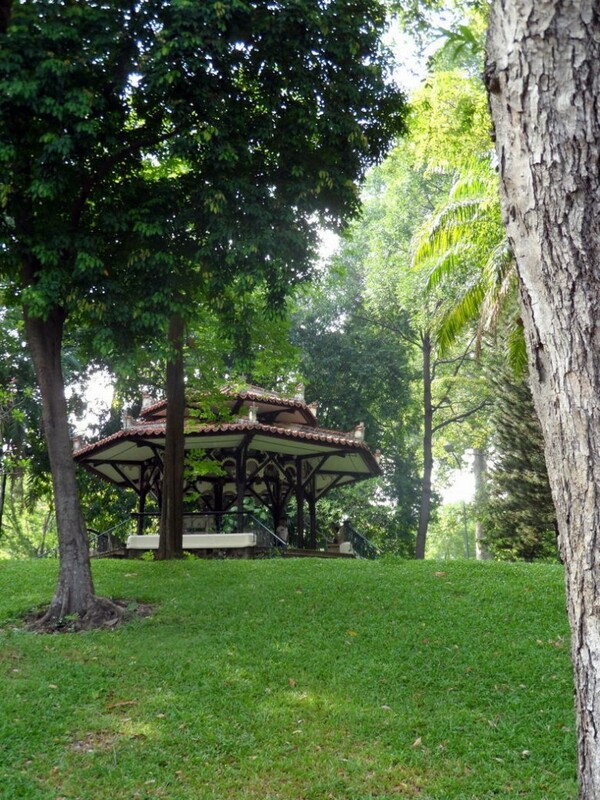 Visitors may also wander around most of the substantial grounds which contain large shady trees and extensive grassed areas. Here they will find a fighter plane that bombed the Palace on April 8th 1975 and the tank that smashed through the gates on April 30th. Definitely worth a visit on any tour to Ho Chi Minh City; Reunification Palace is open all the week from 7.30 AM to 11.30AM and 1.00PM to 5.00 PM. Entrance tickets are VND 30,000 (about $1.30). Guided tours in English are available.